On Thanksgiving at Ford Field, the Chicago Bears take on the Detroit Lions. It’s a short week for the Lions and Bears, who are coming off a Sunday Night Football game. But the stakes are high, with the Bears trying to get that much closer to a division title, while the Lions are trying to climb back into it. On Sunday, Detroit broke a three-game losing streak to beat the Panthers at home, 20-19. This is their second of three straight home-games and they look to make it two in a row against a Chicago team that beat them a few weeks ago. 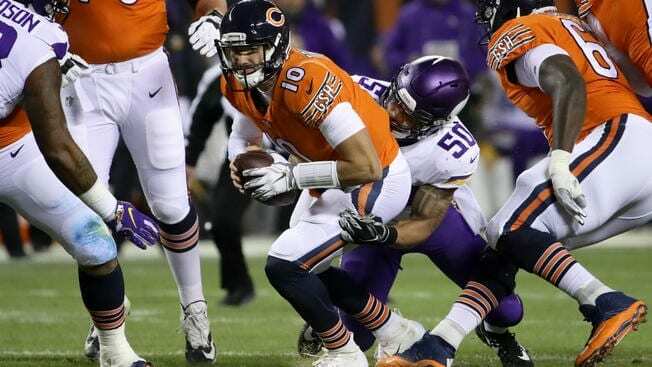 The Bears, meanwhile, further crystallized their status as a rising force with a 25-20 win over the Vikings on Sunday Night Football. Nevertheless, I like the Lions to cover the sportsbook’s spread at home. With these being division teams, they’ve already played and it was just on November 11, only eleven days removed from this game. The Bears won at home, 34-22. The game perhaps looks a little closer than it really was; with the Bears jumping out to a 26-0 lead in the second quarter. Mitchell Trubisky rained down a storm of completions on the Detroit defense, throwing for a robust 355 yards. The Lions’ offense wasn’t able to get clicking until late in the game. Their run-game wasn’t able to make much of an impact, either. What has changed since then? Will the Real Lions Stand Up? Detroit has been one of the streakier teams in the league over the last several seasons. They’re not an easy team in which to get a read from week-to-week. They beat the Patriots, Packers, and Panthers and lose to the Cowboys and Jets. Go figure. When you think you have them figured out, they flip the script on you. One pattern, however, is how well they’ve performed at home where they are more-prone to fire on all cylinders. Against a good Panthers team on Sunday that was really pining for a win, they ran the ball well and got enough big plays on defense to resist a furious comeback by the Panthers, including stopping their two-point attempt at the end as Carolina went for the win. Some may have been holding out, but after Sunday, it might be time to regard the Bears as legit contenders. Even their three losses have been narrow—a one point defeat to the Packers, an OT loss to Miami they probably should have won, and a loss to the Patriots where they were stopped on the one yard-line. And with a win over the Vikings, they now have beaten a good team. They have been accumulating manpower on defense over the years and now field a tremendous unit. Trubisky has developed rapidly and is now playing very well, bolstered by a nice RB package and a rising group of receivers. Is Chicago’s Defense Too Much? Again, this Chicago defense is for real. Their front-seven is immense, with one of the best run-stopping groups up-front. And with Khalil Mack, Roquan Smith, Danny Trevathan, and Leonard Floyd at linebacker, they make a lot of plays. Mack has shown what he can do when the field is balanced with other star players around him. This might be the best Chicago “D” since they won the Super Bowl over 30 years ago. And while Detroit was able to put up points against them a few weeks ago, we also saw this defense handling them as the Chicago offense got off to a fast start. Then Detroit starting doing their thing, as it was too little/too late. For the Detroit offense to thrive, Stafford needs to get off and last time, they picked him off twice and had him bottled up until late when it didn’t really matter. They got to Stafford six times for sacks, with Mack getting two. The Lions are hoping some of the late-game momentum from a few weeks ago carries over this week on Thanksgiving. A few things shake out well for them and winning last week allows them to enter this spot with some positive inertia at least. Again, they fire more regularly at home and they are nice and dug in, even more advantageous on the short week. While it was in a losing effort, their offense did have some success against the Bears, with Kerryon Johnson running for a score and Stafford moving the chains. Maybe Stafford can cut out the picks and Johnson doesn’t fumble and then perhaps it’s a little bit of a different story. The Detroit pass-defense wasn’t too hot the first time around, as Trubisky had his way more or less. We haven’t seen much playmaking from the Detroit secondary this season, which has been a letdown. This past week, Cam Newton put up 357 yards passing. So they are not in good form. But in holding Carolina to 19 points, it shows that big passing yardage doesn’t always equal point-scoring. A few weeks ago, they held Kirk Cousins to just 164 yards. They’re just inconsistent. And maybe they can do better this week. They were at least really effective against Chicago running backs Jordan Howard and Tarik Cohen, also keeping Trubisky calm with his lively legs. Still, they will need to find some answers for Trubisky’s arm this week. Maybe being at home and getting a big play or two will tip this in their favor. Perhaps the Detroit offense is starting to form an identity. There is no disputing that with the play of LeGarrette Blount and rookie Kerryon Johnson, they have a much-improved run game this season. It doesn’t fire automatically, but it looms as a threat and has performed well against some good defenses this season, even at times against the Bears a few weeks ago. And while Stafford sometimes leaves something to be desired with his fat stats and low point-outputs, there are some weapons to exploit aerially with Kenny Golladay developing quickly, along with Marvin Jones (questionable), Bruce Ellington, and other ball-catchers trying to crack into the rotation. At home, they have been able to showcase a well-balanced unit more often than not. Again, you don’t want to try to time a comedown for the Bears. When a team works as hard as they have to get to this spot, it’s a weird time to grow complacent. Still, it’s a tough road-spot against a team they’ve already beaten. I see a streaky Detroit team being toward the higher end of their spectrum of different forms this week. They will register enough big plays on both sides of the ball to cover the spread. I’m taking the Lions at home on Thanksgiving. Loot’s Pick to Cover the Point Spread: Detroit Lions +3.5 points.